Even diluted it is the most powerful cleaner, ever. 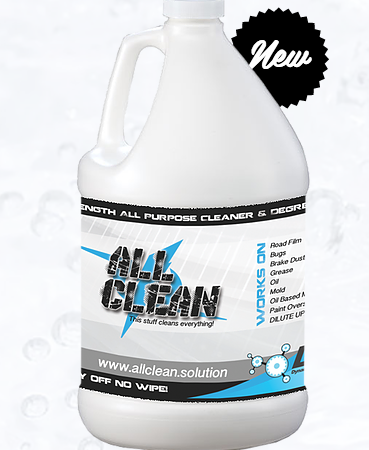 All Clean is an alkaline all purpose cleaner degreaser made with a unique blend of biodegradable high foaming surfactants, chelating agents and alkaline builders. Phosphate and butyl free. Highly concentrated, but safe to use full strength. Removes most soils and contamination without scrubbing- spray on and spray off. 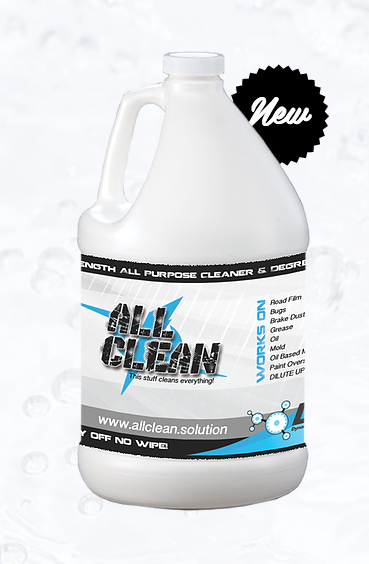 We formulated All Clean to be used on the widest range of applications possible; one product takes the place of many! Dilute 30-1 removes bugs and most road films. Dilute 6-1 for brake dust and oxidation removal on wheels. Dilute 4-1 to straight for heavy engine degreasing. In most cases, 4 to 1 for carpet spotting and cleaning. Full strength for tar and paint over spray (may require scrubbing). Do not use on polished aluminum stronger than 30 to 1. Do not allow any chemical or detergent to dry on painted automotive surfaces. RV/Boat- Removes black streaks. Cleans vinyl upholstery. Cleans mud from quads. Home/Kitchen – Stovetop, grill, pots/pans. Gutter cleaner. Concrete cleaner. Lawn furniture cleaner. Do not use on granite or marble surfaces. Industrial/commercial – Pressure washer detergent. Drilling mud cleaner. Cleans permanent marker with scrubbing. Heavy equipment cleaning and degreasing.